Serge Haroche is an atomic physicist at the Collège de France. He was awarded the 2012 Nobel Prize in Physics along with David J. Wineland "for ground-breaking experimental methods that enable measuring and manipulation of individual quantum systems." September 11, 1944Birth, Casablanca (Morocco). 1963 – 1967Obtained BSc in Physics, Ecole Normale Supérieure (ENS Paris), Paris (France). 1967Obtained Doctorat de Troisieme Cycle, Université Pierre et Marie Curie (Pierre and Marie Curie University), Paris (France). 1967 – 1975Research Associate (1967-1971); Researcher (1971-1973); and Senior Researcher (1973-1975), Centre national de la recherche scientifique (CNRS), Paris (France). 1971Obtained PhD in Physics, Université Pierre et Marie Curie (Pierre and Marie Curie University), Paris (France). 1971Awarded Prix Aimé Cotton, French Physical Society. 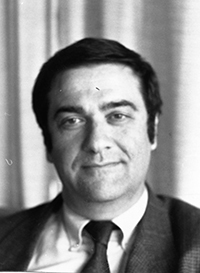 1972 – 1973Visiting Scholar, Stanford University. 1973 – 1984Lecturer of Physics, École Polytechnique, Palaiseau (France). 1975 – 2001Professor of Physics, Université Pierre et Marie Curie, Paris (France). 1979Visiting Scientist, Massachusetts Institute of Technology (MIT). 1981Visiting Professor of Physics, Harvard University. 1982 – 2004Professor of Physics (1982-2001) and Director, Physics Department (1994-2000), Ecole Normale Supérieure, Paris (France). 1983Awarded Grand Prix de Physique Jean Ricard, French Physical Society. 1984 – 1993Professor of Physics, Yale University, New Haven (Conn.). 1988Awarded Einstein Prize for Laser Science. 1991 – 2001Member, Institut Universitaire de France. 1993Awarded Michelson Medal, Franklin Institute. 2001Awarded Tomassoni Award, La Sapienza University. 2002Awarded Quantum Electronics Prize, European Physical Society. 2007Awarded Gra-Cruz Ordem Nacional do Merito Cientifico. 2007Awarded Charles Hard Townes Prize, American Physical Society. 2009Awarded Médaille d’or du CNRS. 2009Member, Brazilian Academy of Sciences. 2009Member, European Academy of Sciences. 2010Awarded Herbert Walther Award, German Physical Society and Optical Society of America. 2012Awarded Nobel Prize in Physics with David J. Wineland "for ground-breaking experimental methods that enable measuring and manipulation of individual quantum systems". PhD advisor at Ecole Normale Supérieure (ENS Paris). Shared 2012 Nobel Prize in Physics "for ground-breaking experimental methods that enable measuring and manipulation of individual quantum systems." Obtained BSc in Physics (1963). Professor and Director, Physics Department. Research Associate; Researcher; and Senior Researcher. Obtained Doctorat de Troisieme Cycle (1967) and PhD in Physics (1971). Professor of Physics. Member and Fellow. Awarded 2007 Charles Hard Townes Prize. Awarded 2010 Herbert Walther Award. Awarded 2002 Quantum Electronics Prize. Awarded 1971 Prix Aimé Cotton and 1983 Grand Prix de Physique Jean Ricard. Oral history interview with Serge Haroche, 2004 February 27. Oral history interview with Pierre Meystre, 2009 February 9 and 10.